My journey with help2read started in 2010 after I retired as an accountant. After returning from an overseas holiday, I came back refreshed and saw an advertisement in our local community newspaper, The Athlone News, in which help2read advertised for volunteers to assist children to read at local schools. A light switched on and I just knew what I wanted to do. My love for reading … imparting to others. 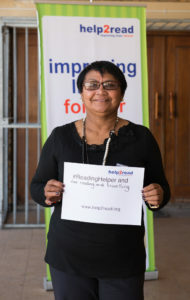 After my training with help2read, I chose to volunteer at Bridgeville Primary School, a school in my area. Since then, I have never looked back. It wasn’t smooth sailing at first. I was, I think, more nervous than the children! I was assigned two Grade 2 learners, who not only couldn’t read but weren’t willing to talk and didn’t like reading. With tremendous help and encouragement from my Volunteer Relationship Coordinator and the school teachers (most especially the coordinating teacher for help2read, Ms Daniels), I started to enjoy the reading sessions, and since my very first session in 2010, I’ve helped 40 children learn to read. Reading sessions quickly reignited my love for children’s books, which led me to start programmes at the school to help bring books to life in the Foundation Phase classrooms. 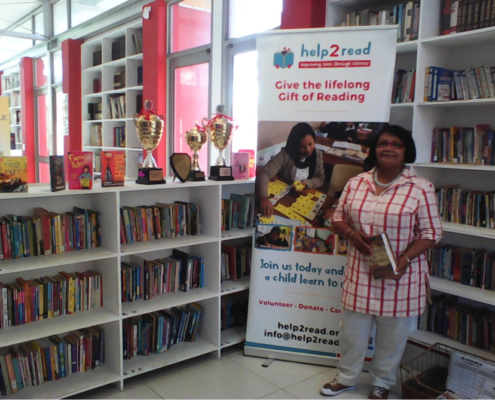 I organised visitations to the Bridgetown Community Library for Grades R to 7 and helped mentor and tutor learners to compete in the Growsmart Spelling Competitions and the Bridgetown Library Reading Competition. Every year, with my motivation together with the children’s eagerness and determination, we always came home with trophies. In 2017, my learners won all the trophies at the Reading Competition for reading, spelling and comprehension. The children are always so eager to take part in this event. Bridgeville Primary opened a brand new library in 2016, and I gladly took on the task to oversee library periods at the school. I organise reading of books, discussions and the dramatization of stories for Grades R to 7. It excites me to see pupils come to the library during intervals to read. Over the years, the help2read volunteers and I have witnessed our learners receive certificates of merit for achievement in various school subjects at the school’s award ceremonies each year. The seven volunteers who I work with are a blessing. We would always motivate and inspire each other, as well as our learners on the programme. I’d like to say thank you to help2read for instilling and bringing out my hidden talents. Your workshops inspire, teach and give me an in-depth understanding of children who are struggling to read. To share one’s time and personal space teaching young kids the joys of reading should be lauded as education is the one means of improving a child’s life and surroundings. I want to start help2read in my rural area Mpumalanga,please guide me.